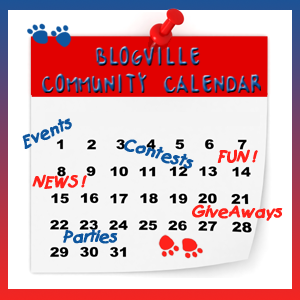 Arty, Christmas, and Lexi (candidates for Mayor) are coordinating our Blogville Pawlympics. The numerous events will all take place from August 5th through August 21st. 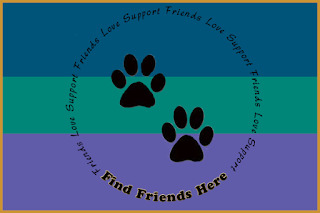 Visit their blogs for details. 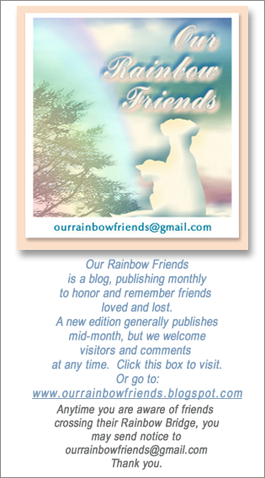 Our Rainbow Friends has published memorials for those who crossed the rainbow bridge in June. Please stop by to honor them and celebrate their lives. Ranger is reminding us of the Wacky July Holidays. See his blog for the complete listing of the month's special holidays days. 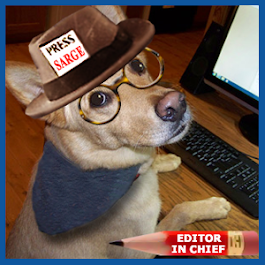 Zoolatry has set up a special Pet Bloggers Mailing List (through MailChimp). This list will be used for notices of Rainbow Bridge crossings, Purrs & Prayers notices, and information about Special Events for pet bloggers, with art images included as needed. If you are NOT on our list, and would like to be included, please email us at zoolatry at gmail dot com and we will add you. If you are on the list, and want to be removed, let us know. Thank you one and all. 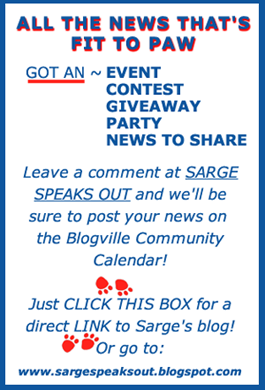 Thanks Sarge! We put our paws on our hearts as we passed by the Blogville flag!